How many sales growth tools do you know? 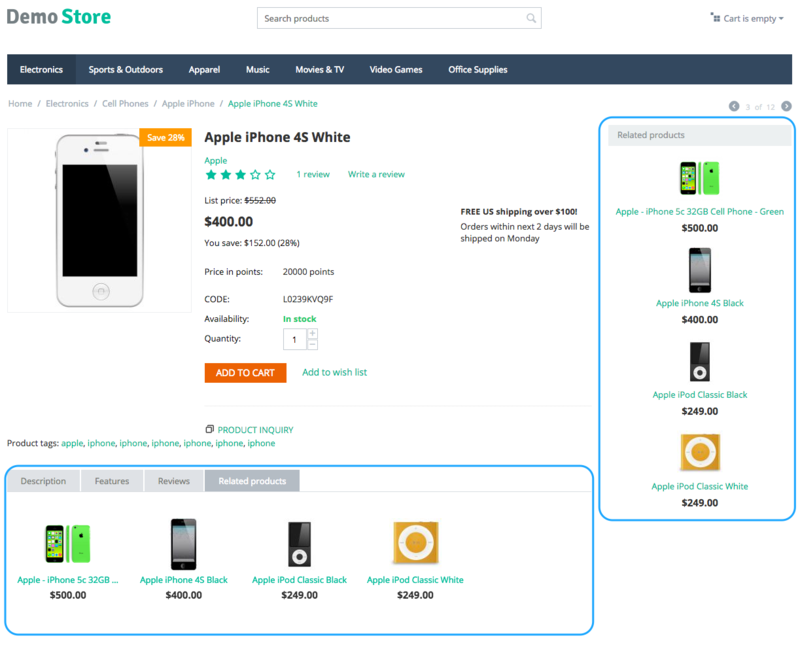 Today we will show a new way of internet store set up which will increase your sales by means of product relations. Free 1Clue add-on "Related products" for CS-Cart allows you to add products to a separate list which is displayed under the selected product tab. Here we will discuss extended and improved version of this module which represents an automated system where you do not need to process each product unit. Over 1000 products can be structured if you perform a few simple steps. When you install the add-on, you can set it up by following the link ‘Settings’ at the add-ons list page. This is where you need to configure two parameters: type of related products filling and product relation type. Related products filling can be set by "Fill related products" option to one of the either values: Manually or By Tags. Addon "Related products (extended)" significantly increases admin capacity and makes his work more efficient. This is achieved by tagging products. For instance, you sell a set of similar products of the same brand let it be Apple. Main tag for this product will be: "apple". Subsequently, all products that are related to this brand (thus the tag "apple" set by you) will come up in related products block/tab. Also you can set the related products manually. This option allows you to use "Select the product links type" which will be described in details bellow. To add realated products, you should go to the "Related products" tab and use picker which appears after click at "Add products" find and select all the products you need. Keep in mind that you should save the product detailed page after the products were added. Relation types: what is it for? Cross-linked. This method is unique and useful, because the administrator can set up a multidirectional connection between several products. When you chose a set of phone models and you wish to set up the same set of models for each mobile phone as related, you need to use cross-linked type. Therefore, as you follow the links moving from one phone to another, you will see a full list of products. Bi-directional. Looking at the name itself one could tell, this is a two-way type. The main difference between cross-linked and bi-directional type is in product "visibility". Therefore, all three phones will be related to the main phone, but will not be related between each other, whereas the main phone still will be related to each of them. No relation. This is a common one way linking of the products, same as you can do in the Block manager. There is another great feature. Export/Import of related tags, which allows you to modify all the product tags in your favourite text/table editor and then just import this file back to your store, without any need to modify each product individually. When addon "Related products (extended)" is installed you will see, at the export page (Administation -> Export Data -> Products) an additional field "Related tags". To add this field to the export group, you need to choose it from the list of available fields and move to the left multi-selectbox "Exported fields. Here is how the exported file looks like, as you can see the Related tags column contains all the tags for a product separated by a comma. After all the required changes are done, and analogues tags are set you can import this file back to cs-cart store. The related products will be created automatically, during the import process. Caution: Related products will be created automatically only in case "Fill related products" option is set to "by tags"
There are two options to display related products using this addon. Choose the "Create new block" link and set up type "Products"
Name the block "Related products"
Then click on tab "Content" and choose type "Related products". Click on "Create"
As a result you will have a new block "Related products" at each product details page under the main content section. An alternative for related product display is "Tabs". All products which correlate with the one selected, will be displayed in a separate tab same way as description and other content does. In the right hand upper corner, click "+ Add Tab"
Name the new tab "Related products" and click "Select Block"
Therefore, we have created a new tab to display related products in the tabs area of a product. Hope this article was useful for you. You can always ask your questions using Contact Us form. To buy the extended version of Related products add-on please click the button below.